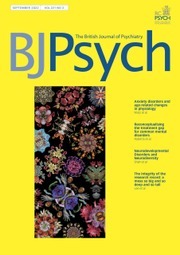 The British Journal of Psychiatry (BJPsych) is a leading international peer-reviewed journal, covering all branches of psychiatry with a particular emphasis on the clinical aspects of each topic. Published monthly on behalf of the Royal College of Psychiatrists, the journal is committed to improving the prevention, investigation, diagnosis, treatment, and care of mental illness, as well as the promotion of mental health globally. In addition to authoritative original research papers from around the world, the journal publishes editorials, review articles, commentaries on contentious articles, short reports, a comprehensive book review section and a lively, well-informed correspondence column. The journal is essential reading for psychiatrists, clinical psychologists, and all professionals with an interest in mental health.